You Won’t Believe What Happened! | Sing. Dream. Hope. Pray. Disclaimer: Unless you are the parent of a child who faces exceptional challenges or has special needs, the following maybe lost on you. And that’s okay. Truly. It is. This may not seem like a big deal to you, but today Jackson snapped and unsnapped his shorts. You may not grasp the significance of this, but I’ve waited for years for this to happen. I’m talking about what most folks perceive to be the simple act of closing a fastener with two fingers and two thumbs. To date, this simple act has been out of Jackson’s grasp (no pun intended). While I was getting dressed this morning, Jackson came running in to show me what he had done. I was happier for the pride he had in himself than I was for how proud I was of him. We’ve worked on this “simple” act for years. Today was a watershed event for our son. 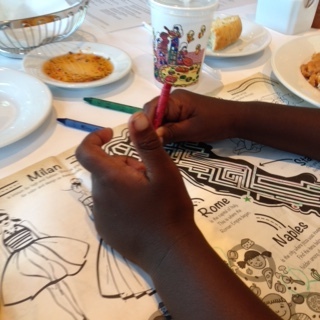 Additionally, while at lunch, Jackson was able to traverse independently, and follow instruction when needed, in order to complete the maze on the restaurant’s placemat. Please don’t miss this. Jackson has worked with an occupational therapist for years. Until recently he was unable to properly grasp a writing implement. The fact that he is not only able to hold a Crayon, but is able to focus and discern a path and heed instruction is something we thought to be potentially impossible. Our God is so good, folks. He is so very, very good. And we are so very, very grateful. This entry was posted in Autism, Parenthood, parenting and tagged ASD, autism, blessings, child with special needs, children, developmental delays, grateful, gratitude, parenthood, parenting, special needs on October 20, 2014 by Bobbie DuBose.